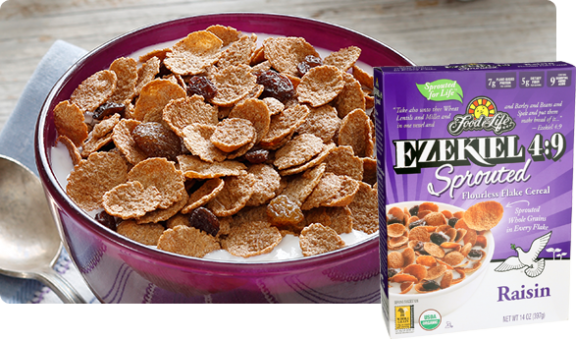 Start your day off right with Ezekiel 4:9 Sprouted Grain Raisin Flake Cereal. Just like our original Ezekiel 4:9 Sprouted Grain Flake Cereal with the added benefit and flavor of raisins. Ezekiel 4:9 Blend: (Organic Sprouted Wheat, Organic Sprouted Barley, Organic Sprouted Millet, Organic Sprouted Lentils, Organic Sprouted Soybeans, Organic Sprouted Spelt), Organic Raisins, Organic Malted Barley, Organic Agave, Sea Salt, Organic Rosemary Extract.